On May 16th, The Energy Futures Initiative (EFI) and the National Association of State Energy Officials (NASEO) released the 2018 U.S. Energy and Employment Report (USEER). The USEER offers data on employment trends in four key energy sectors – Electric Power Generation and Fuels; Transmission, Distribution and Storage; Energy Efficiency and; Motor Vehicles. 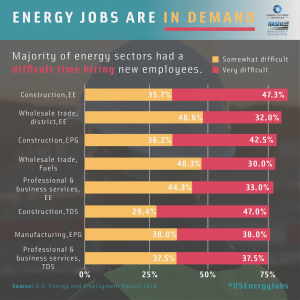 This is the third installment of the energy jobs survey established by the U.S. Department of Energy in 2016. Overall, firms covered by the survey anticipate roughly 6.2 percent employment growth for 2018. Energy Efficiency employers project the highest growth rate over 2018 (9 percent), followed by Electric Power Generation (8 percent); Motor Vehicles (almost 7 percent, including a 6 percent increase in manufacturing), Transmission, Distribution, and Storage (3 percent), and the Fuels sector (2 percent). Solar firms employed in whole or in part 350,000 individuals in 2017. That represents a reduction of 24,000 jobs in solar in 2017 — the first net loss since jobs were first collated in 2010. Energy Efficiency jobs created the most new jobs across all four sectors, adding a net of 67,000 jobs. Ideally, the 2018 USEER will be used to better inform federal, state, and local policymakers; academic decision-makers; and the private sector in developing integrated energy, security, economic development, and workforce plans. This kind of integration is key to maximizing the benefits of the nation’s abundant energy resources, rapid pace of energy innovation, and dynamic energy markets. EFI and NASEO hope the data presented in this report will help advance the understanding of the economics of emerging energy industries. Creating a single and consistent measure of employment across the entire U.S. energy system is critical to that understanding. The report can be found at www.usenergyjobs.org and in OEP’s Resource Library. 1) What steps can policymakers take to better prepare America’s labor force for employment in these four key energy sectors? 2) What aspects of the 2018 USEER did you find most significant? The “US Energy and Employment Report” is a very good step in alerting the younger generation and adults seeking new employment about opportunities that currently exist in renewable energy and energy conservation sectors. I believe the United States needs to go much further in educating the future workforce for participating in the clean-energy economy needed to address the global warming crisis. Schools, colleges/universities, and government workforce development programs have a key role to play in effectively transitioning the U.S. and global economy to be based on clean energy. All students must be taught why this is important, understand the general methods to achieve this transition, and be aware of the skills they will require to work in the new clean-energy economy. Students in science courses should be taught the fact that greenhouse gas emissions cause global warming and about the evidence that climate scientists have accumulated that global warming and climate change is occurring and will continue if not addressed. They should be made aware of the devastating impacts of long-term global warming such as sea-level rise flooding coastal cities, severe storms, extreme droughts, extensive wildfires, heat waves killing many people, spreading of new diseases, and extinction of other species. Students (young and older) should be taught that implementing clean-energy infrastructure for energy supply, transportation, energy conservation in residential/industrial sectors, and other methods of reducing greenhouse gas emissions are the way to solve the global warming problem. It needs to be emphasized that every individual, business, and organization globally has a role to play for society to have a livable environment in the future. People will be driving alternative-fuel vehicles such as electric cars, use more public clean-powered transit and substitute telecommunications for transportation where possible, they will purchase renewable solar and wind power, and they will purchase energy-efficient appliances and live in smart homes that consume energy efficiently. In terms of workforce skills, the federal government Dept. of Labor should have a mandate to research and document the workforce and skills needed for the U.S. to achieve a clean-energy infrastructure. This involves a number of areas such as: renewable solar/wind energy production, national smart electric power grid development, energy conservation through retrofitting and design of homes/buildings, energy-efficient appliances, new agricultural practices, manufacturing of alternative-fuel (electric, natural gas, hybrid, etc.) vehicles, design of public transportation (bus, rail, airline) systems, and new digital infrastructure including high-speed broadband wireline/wireless access networks and advanced telecommunications services to substitute for transportation. The federal Dept. of Labor should partner with the federal Dept. of Education and state workforce development agencies and departments of education to develop plans for universities, community colleges, and trade schools to properly train students in these areas. The education needs to begin in the K-12 school system, with visiting industry and government speakers informing the schools and students about the needs and opportunities in the 21st century sustainable economy and the required capabilities students must acquire to properly participate. The transition to a global clean-energy economy is a long-term transition. Our education system and government will have critical functions to perform in preparing young people properly for the future society they will live in and be responsible for sustaining.